Dice or tear the cornbread into 1 inch pieces and place in a large bowl. In another small bowl mix the milk with the eggs and salt. Add sliced green onions, diced poblano, Andouille sausage and cheddar to the cornbread and toss well to mix. Pour the milk mixture over the cornbread mixture and toss until all the cornbread is covered and absorbing some of the milk. Pour the cornbread mixture into a 2 quart greased baking dish or cast iron skillet. Top with another 1.5 cups of shredded cheddar. Place a piece of Saran wrap directly on top of the cheese and then place a pan the same size as the one you used on top of the saran wrap, and weight it down ( you can place a few cans or some items from your fridge on top). Leave the eggs refrigerated overnight. The next morning, remove the weights and the Saran wrap. Place the eggs in a 350 degree oven and bake for 20 – 25 minutes until top is browning and an instant read thermometer register 160 degrees. Let the eggs cool down for about 5 minutes before serving. Each week in Metro Pulse, contributor Benjamin Pounds explores often overlooked trails located outside of the Great Smoky Mountain National Park. Quite a few are around an hour’s drive from Knoxville making sure you spend more time on foot exploring abandoned farmlands or admiring mountain views than being trapped in the gridlock that sometimes overwhelms a trip to the Smokies. Whether headed west to the Black Mountain section of the Cumberland Trail or north on I-75 to Cove Lake State Park in Cumberland County, it’s important to bring food that travels well and doesn’t add too much weight to your pack. While out on the trail, Mahasti’s Appalachian Trail Mix Cookies are the added sweetness (white chocolate chips!) and crunchiness (Flour Head Bakery Honey Almond Granola!) your hike needs. Take these cookies on your next outdoor adventure and share photos of your gang on Instagram with us. We’d love to see the satisfied faces after a few hours in the woods. FHB Honey Almond Granola is available at both Tomato Head locations as well as Butler and Bailey Market, Kroger Bearden, and Three Rivers Market. In a large mixing bowl, or in the bowl of a stand mixer, cream together the butter and the sugars. Add the egg and vanilla and beat until smooth. In another bowl mix together the flour with cinnamon, salt, baking powder and baking soda. Add the dry ingredients to the creamed butter and mix well until everything is well combined. Add the granola, dried cranberries and the white chocolate chips. Mix the batter until the ingredients are mixed in well. Drop the dough by the tablespoonful onto a parchment lined baking sheet, leaving 1-½ inches between each ball. Bake the cookies in a 350 degree oven for 12 – 14 minutes or until they are golden brown around the edges. Remove from the oven, and allow the cookies to cool. If you’ve spent anytime at the Market Square Farmers’ Market over the past few weekends, you’ve noticed an abundance of summer squash. This simple recipe for Mahasti’s Summer Zucchini & Poblano Soup is a great alternative to preparing zucchini the traditional summer way – standing over a hot grill. Incorporating poblano peppers adds a slightly sweet and earthy flavorful without overwhelming your taste buds with lots of heat. 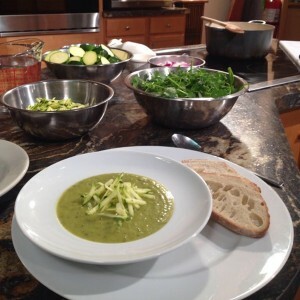 In case you missed her cooking segment on WBIR last Saturday, we’ve shared Mahasti’s on our blog so grab some local homegrown squash on your next shopping trip and give this recipe a spin in the comfort of your kitchen. Peel and dice onion and set aside. Peel garlic, roughly chop and set aside. Rinse pepper, cut down the middle, remove stem and seeds, and cut into 1inch strips and set aside. Remove the ends off all of the zucchini. Cut 4 of the zucchini into 1inch rounds and set aside. Shred the remaining zucchini and set aside separately. Remove about 1/2 inch off the bottom of the cilantro stems. Place the cilantro in a large bowl of cold water, swish around, and then lift the cilantro out of the water. Repeat the wash process with fresh water until there is no dirt left in the bottom of your bowl when you remove the cilantro. Roughly chop the cilantro and set aside. Heat oil in a large pot over medium heat. Add onion and garlic and sauté until onions are translucent. Add zucchini, pepper and water. Bring the soup to boil, and cook for 15 minutes. Remove from heat. Add cilantro and salt and blend with an immersion blender until soup is smooth. 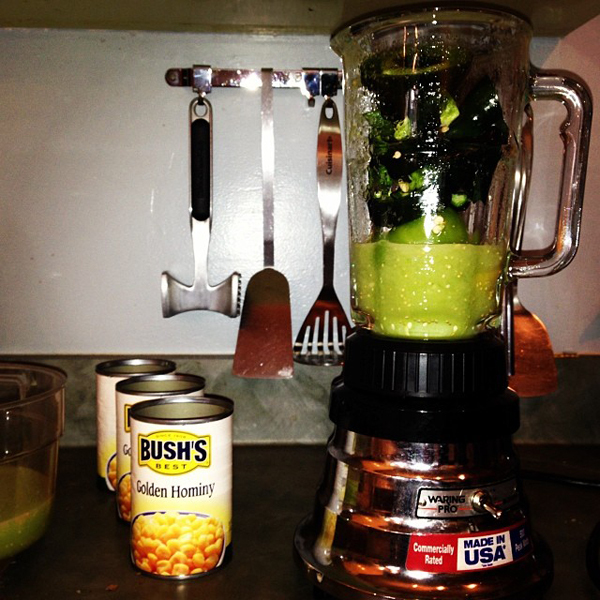 If using an upright blender, wait for soup to come to room temperature before blending to avoid burning yourself. After soup is blended add the shredded zucchini. If you used an immersion blender soup will be ready to serve immediately. If you cooled your soup in order to use an upright blender, the soup can be re-heated after you add the shredded zucchini. Serve with Flour Head Bakery bread and enjoy. Celebrate National Strawberry Parfait Day! June 25 is National Strawberry Parfait Day and Mahasti wants you to cool off with her version of this classic, summer treat. She recently shared this recipe on her WBIR cooking segment, where you can catch Mahasti every first and third Saturday of the month. You can also find all of those special recipes right here on our blog. bon appetit! Make your favorite sugar cookie dough. Scoop the cookies out into small balls onto a cookie sheet and bake the cookies for 10 – 12 minutes or until done. Ideally the cookies will bake up to the size of a half dollar. You will need 3 cookies per parfait. Allow cookies to cool. While the cookies are baking, wash, stem and quarter the strawberries and set aside. In a medium bowl mix the sour cream, heavy cream, and powdered sugar together with a whisk or hand mixer, until smooth. Place 1 small cookie in the bottom of a glass or bowl. 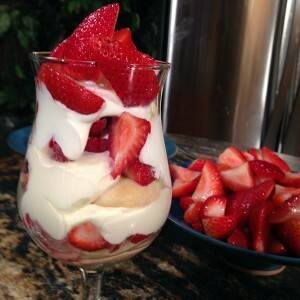 Top with about ¼ cup of sliced strawberries followed by ¼ cup of the sour cream mixture. Place another cookie on top of the sour cream mixture and repeat the process. Place one more cookie on top and top with ¼ cup more of the sour cream mixture. Parfaits can be assembled up to 6 hours before, or can be eaten immediately. 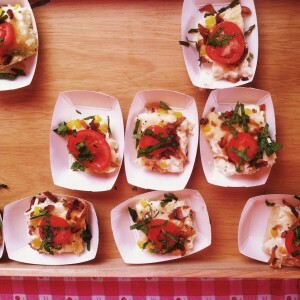 Celebrating Cinco de Mayo includes more than just deciding between frozen or on the rocks. Our blog is chock full of great recipes of your favorite Mexican dishes like pambazos, ancho and coffee roasted pork torta, sopes with chorizo and pickled onions, and chicken enchildas. Enjoy this fun, easy to follow, flavor-packed recipe featuring chorizo sausage during tonight’s festivities. Spread corn tortillas out onto a cookie sheet. Spread each tortilla with the equivalent of 1 tablespoon of refried beans. Top with chorizo, cheese and jalapenos. Place tacos in the oven until cheese has melted and ingredients are hot, but tortillas are still soft – 5-7 minutes. 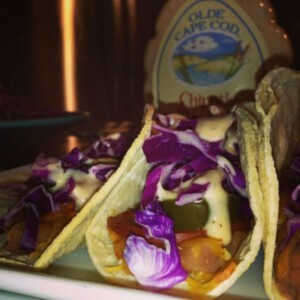 Remove tacos from oven and top each taco with shredded cabbage and chipotle ranch dressing. 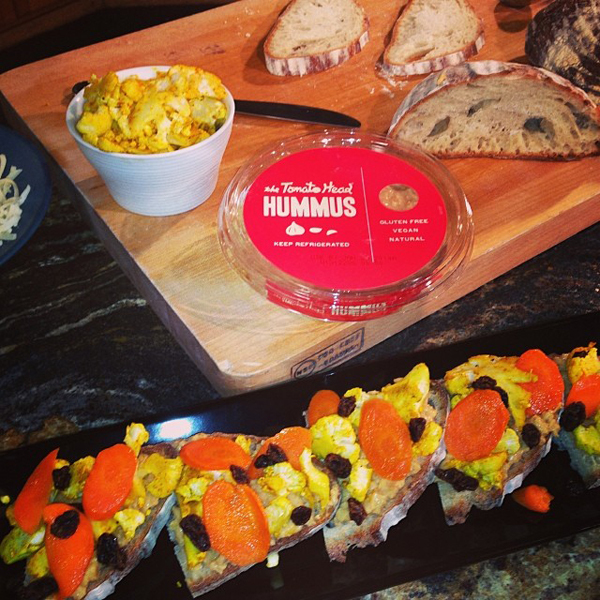 Tomato Head’s Hummus Tartines with Moroccan Carrot Salad and Curried Cauliflower. Preheat oven to 350 degrees. Toss carrots with oil, place on a baking sheet in one layer. Bake Carrots for 10 minutes. Place Carrots in a medium bowl. Add Lemon Juice, Honey, Raisins, Allspice and Salt to Carrots. Toss until evenly coated. In a medium bowl toss cauliflower with oil, salt and curry powder. Place on a baking sheet in one layer. Bake Cauliflower for 10 minutes. Slice Sourdough, and spread slices with Tomato Head Hummus. Sprinkle with Shredded Monterey Jack Cheese. Top with Curried Cauliflower and Moroccan Carrots. Bake in 350 degree oven until cheese has melted and vegetables are heated through. Serve immediately. Carrots can be served at room temperature as a side dish with Chicken, Fish or Steak.